The blog is being updated. It will include all previous posts. Please be patient. Nonetheless, if you want to get up to speed on their activities, these two links will do a good job. (pdf) Tutorial. Quite a large file (~ 7.25 MB), but lots of good information. (pdf) Spectrum Sharing in TV White Space Workshop. As part of its June meeting in Detroit (June 15-18), the SDR Forum will host a workshop on coexistence of TV white space devices on June 16. They’re currently soliciting proposals for presentations through April 1. Intelligent Transportation Systems effectively apply the concept of a cognitive system to the management of transportation systems (gather information, recognize patterns, apply rules / reason, learn from past actions). Wireless links play a big role in transferring information and control messages and cognitive radio can help improve the communications quality and availability in this highly dynamic environment. Once cognitive radio is integrated into and fielded with ITS, we’ll have “cognitive systems of cognitive systems”, which is one of the broader trends I see for the future. As of this week, I’ll be giving a 30-minute talk with Ashwin Amana on cognitive radio and intelligent transportation systems at the SDR Forum ITS Workshop, also at the SDR Forum Detroit meeting (so many great workshops crammed into such a short meeting). Really, it’s a panel to highlight NIJ’s communications related research efforts. But one of the major thrusts has been cognitive radio. Charles Bostian of VT will be discussing their NIJ-funded efforts to create the Public Safety Cognitive Radio (PSCR) node. IWCE is March 16-20 (Vegas), and the panel is on March 18th, from 1:30-2:45 PM. (link) EMC Electronica article on embedded SDR and CR. I don’t know who he is, but James (not me) is posting his notes on his “4th year project on cognitive radio” as it progresses. At least so far, he’s doing a good job of capturing and linking to important papers. (link) The SDRF sends a reminder that abstracts are due March 20. (link) The 3rd annual Smart Radio Challenge is now open. (link) In conjunction with WiOPT09, RAWNET – The 5th workshop on Resource Allocation, Cooperation and Competition in Wireless Networks – is inviting papers on cognitive spectrum management. The conference will be held in Seoul on June 27, 2009. It’s particularly interested in papers related to the cooperation and competition in wireless networks. (link) WIth some public safety entitites, the CTIA urges ban of secondary access in 700 MHz. Looks mostly focused on clearing out legacy wireless microphones and ensuring that white space devices don’t creep up the spectrum. (link) NAB is suing to try and block white space devices. This surprising to me as I thought geographic databases and non-adjacency were what MSTV and NAB were looking for. The suit certainly colors my opinion of MSTV and NAB’s efforts viz a viz the white spaces. Wi Not WiFi on Steroids? Though the term was first applied to WiMAX (link), “WiFi on Steroids” now commonly refers to a use-case for the white spaces (link) for WiFi-like access points in the UHF bands, but better, stronger, faster and so on due to the ongoing advances in technology. As an initial business model, it’s a good place to start as there’s ALOT of demand for high-speed access at the home as evidenced by WiFi and if someone can build a better WiFi access point, the world should beat a path to their door. However, I don’t think we’ll be able to successfully market white space devices as WiFi on Steroids. All else being equal, you get higher data rates (what most people think of for “WiFi on Steroids”) by either grabbing more spectrum or using spectrum more efficently. Sure, as a nation, allowing the opportunistic use of unused spectrum improves nation-wide spectral efficiency, but it doesn’t improve spectral efficiency for a given link. Which means that on its on, you’re not going to be squeezing higher peak bps/Hz over your WiFi link just because it’s now running DSA. In other words, simply downbanding WiFi won’t get you massively increased throughputs that would be required to encourage people to abandon their ISM-band WiFi. Augment, maybe in a dual-mode cross-band channel bonded mode to increase throughput, but the extra front ends and necessary isolation seems expensive and wouldn’t be anything that couldn’t theoretically be done with ISM and UNII bands and dual RF ports, which isn’t exactly driving the WiFi market now. That means that in order to increase data rates up, we’ll have to use wider bandwidths or improve spectral efficiencies the old fashioned way, i.e., higher-order modulations and / or antenna arrays (ala .11n). Since I don’t think that in practice we’ll be using higher-order modulations, that leaves antenna arrays. Typically, that means MIMO (which in its own way is grabbing more “bandwidth” via spatial channels). But for MIMO you need low spatial correlation, which in practice means antenna spacing that is a significant fraction to multiples of a wavelength. I’ve seen studies showing gains for as low as quarter wavelengths, but a full wavelength or more is the rule of thumb. But what’s a wavelength in the UHF bands? To simplify the math, let’s use 300 MHz (right in the middle of the band). The wavelength is then 1 meter (a little better than half your height) which is not a good form factor when compared to the 0.125 m (3e8/2.4e9) spacing for the ISM band. So perhaps we just grab more spectrum to offset the MIMO loss (roughly, call it a factor of 2 loss that from not being able to use MIMO), which is reasonable because the spectrum is free. That may not be much of an option in the big cities where the customers are. The studies I’ve seen have shown 14 available channels in a city such as LA once channel adjacency requirements are met. That means there’s 6×14 = 84 MHz, which is not much more than what is used in the the ISM band (e.g., 79 1 MHz channels in Bluetooth). Sure there’s a lot of interference in the ISM bands now, but with longer propagation in the UHF bands, interference will quickly become a factor there too. Now there are creative ways to get around this, particularly with cooperative / synthetic MIMO techniques (e.g., co-deploying UHF-WiFi with your home stereo system to use the speakers as widely separated antennas or just add on antennas with wires for your WiFi AP), but they’re kinda klugey and not with the plug-and-play factor that gave WiFi it’s mass appeal. So in short, I don’t think the WiFi on steroids as it relates to higher data rates makes much sense as a business model / use case. And since it’s been marketed as “WiFi on Steroids” (much higher throughput which I think is not possible in the most valuable markets) and not just a different band for WiFi (ala the differing bands for cordless phones), I think the market will be really slow to adopt these devices. What I think may make more sense are applications that don’t need as much throughput (so exotic channel bonding techniques aren’t required) but would benefit from better coverage (due to the downbanding) and free spectrum. For example controls sorts of applications ala zigbee (cognitive zigbee if you will) makes sense for home automation applications and factory applications and meter reader sorts of things (which for maximum buzzword density makes white space devices a good candidate for supporting the smart grid). These sorts of coverage (range) intensive, but low throughput applications are what I think will win out in the coming white-space deployment race. DoD Implicitly Requiring Policy-Based DSA on SDRs? I attended a talk by Jeff Boksiner at the IDGA SDR conference where he spoke on DOD Instruction 4650.01 issued on Jan 09, 2009 (pdf), which requires new devices to have a Spectrum Supportability Risk Assessment (SSRA) performed at each acquisition milestone (conceptual, experimental, developmental, operational) to determine the impact on all known “spectrum dependent systems” (SDS) where the devices will be deployed. Officially, it’s not used for a go/no-go decision on the purchase / acquisition, but if it degrades performance too much (either of their own or another system, including systems of other friendly nations), you know it will. In theory, vendors will adjust their designs (e.g., bandwidths and operational channels) when performance is too degraded. In my interpretation, this regulation is implicitly mandating the use of DSA-based policy-enabled software defined radios because of the costs of potential redesigns and the inherent advantages of SDR and policy-based cognitive radios. The following are a few excerpts from the instruction. Pursue spectrum-efficient technologies to support the increasing warfighter demand for spectrum access and encourage development of S-D systems that can operate in diverse electromagnetic environments (EMEs). (1) Without degradation to the DoD mission. (3) With minimal risk that such sharing will result in loss of access to the spectrum necessary to perform the DoD mission. d. DoD Components shall obtain U.S. Government (USG) certification of spectrum support, as required by Reference (f), prior to authorization to operate for experimental testing, developmental testing, or operations of S-D systems in the United States and its possessions (US&P). As required by Reference (e), USG certification of spectrum support shall be obtained prior to submission of cost estimates (i.e., prior to Defense Acquisition System Milestone B (Reference (i)) for development or procurement of major S-D systems and for all space and satellite systems. In addition, some HNs require their own certification before providing authorization to operate. Since this requirement is by operation , potentially doing a redesign for each deployment will be insanely costly. Assuming the set of SDSs grows over time (as more and more radios are deployed), then even deploying into the same region will be a moving target. However, according to Jeff’s presentation, there is an interest in translating these tests and requirements into policies expressed in software that a policy-defined radio could interepret. Then if a radio can be shown to support all dynamically defined policies, then the same design can be fielded in each scenario and be guaranteed to conform to these changing spectrum support requirements. Non-recurring engineering costs become recurring engineering costs as radios are potentially redesigned for every purchase. Incur larger front-end engineering cost to design a radio that implements policy constrained DSA on an SDR and then allow these changes to be reflected in the policy control. Add in the additional time-delays that the multistage SSRA process will add to the development of non-DSA polikcy constrained radios, and I think it’s a no-brainer. (link) Yesterday, Georgia Tech issued a press release announcing their membership in CogNEA. There’s nothing new in the announcement that we didn’t cover earlier, but at least it confirms that I’m not crazy as until now this blog seemed to be the only primary source of information online until now. Via email (and on their site), there’s an announcement that the paper submission deadline is now March 2, which is probably a help for anyone in a rush to make the original deadline (Feb 23rd). Tutorial proposals are still due on the 23rd, however. (link) OfCOM’s proposed rules for interleaved spectrum access. Like the FCC, it’s also a mix of sensing and geolocation. Ok, it’s from Tom Rondeau for while he was at VT. But it was a CR article carried in the local paper and Tom is from Lynchburg. (link) Virginia Tech grad given doctoral award. A Virginia Tech graduate from Jefferson Forest High School has been awarded one of the nation’s most prestigious honors for doctoral dissertations. Thomas Rondeau received one of two Council of Graduate Schools (CGS)/UMI Distinguished Dissertation Awards. See the sidebar of the blog for a link to his dissertation (multi-objective genetic algorithms and learning in cognitive radio). (link) Yesterday, Google et al announced the formation of a group to standardize whitespace database information. [somewhat reordered paragraphs] Founding members of the White Spaces Database Group include Comsearch, Dell, Google Inc., HP, Microsoft Corporation, Motorola Inc., and NeuStar. In the coming weeks and months, members of the group will be offering to the Commission their perspectives, and some specific recommendations, about the technical requirements we would like to see adopted for the database. Many of these specifications ultimately will be heavily technical; put simply, we’ll advocate for data formats and protocols that are open and non-proprietary, with database administration that is also open and non-exclusive. 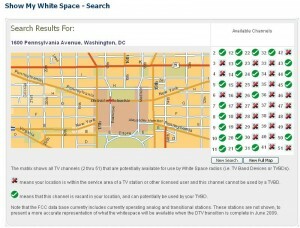 We don’t plan to become a database administrator ourselves, but do want to work with the FCC to make sure that a white spaces database gets up and running. We hope that this will unfold in a matter of months, not years. Following up on the earlier news that Obama wanted to delay the DTV transition, there’s been a couple major events the last two days. First, on Monday, the Senate passed a bill delaying the transition to June 12. Then yesterday, the bill failed in the House. So we’re back on schedule. For now. (link) Off again. Probably until at least June 12 now. Congress yesterday approved a four-month delay in plans to halt analog television, the latest chapter in a troubled effort by the government to clear airwave space for emergency responders and wireless services by moving millions of households to digital television. Pat Carson from TDK gave a short presentation on CogNEA today at the SDRF CRWG / Secondary Spectrum Test Group joint meeting and said the information was for public consumption, so here’s some info in addition to the earlier press release. 2) CogNEA is nominally now “open” for membership, but the new membership process has not been defined. 4) CogNEA is intending this for the following applications: In-home High Definition MultiMedia (HD MM) but not wireless HDMI, Networking and distribution solutions that overcome the whole home coverage problems inherent to solutions using ISM bands, Internet Access for communities, neighborhoods, campuses, Ad-Hoc Mesh networks, Tele-health, Home automation and control. Currently these are handled by different standards (e.g., Zigbee, WiFi, Bluetooth) but the PHY is intended to handle everything (basically WLAN and smaller). 5) The Standard was at V0.70 the last time Pat checked, but it may have been updated at the ECWS meeting (the CogNEA meetings have been going on as sidebars at related meetings). The plan is to bring it to a SDO such as ISO in mid-2009. (pdf) (doc) On Friday (9th), the FCC issued a document noting the errors in FCC 08-260A (”Unlicensed Operation in the TV Broadcase Bands, Additional Spectrum for Unlicensed devices below 900 MHz and in the 3 GHz Band”). (pdf) Here’s a link to FCC 08-260 A. (link) My earlier quicky summary. (pdf) First the good news. Today, the FCC announced that they were starting a white space fellowship program to help regulators around the world get up to speed on the FCC’s experiences. Washington, D.C. – Federal Communications Commission Chairman (FCC) Kevin J. Martin today announced the creation of a new International TV White Spaces Fellowship and Training Initiative. 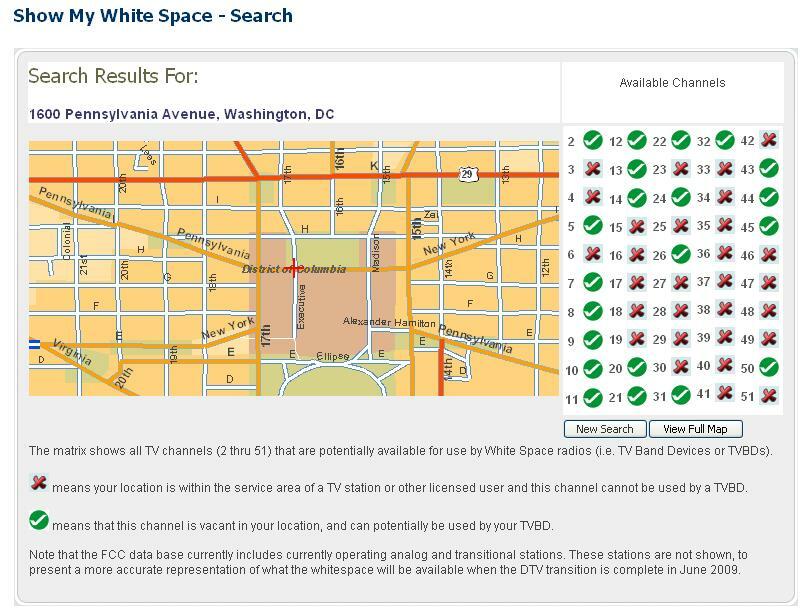 The use of TV white spaces has the potential to improve wireless broadband connectivity and inspire an ever-widening array of new Internet-based products and services for consumers. International experts and fellows will have the opportunity to interact directly with FCC staff through in-country interaction, structured educational dialogue, a dedicated interactive website, online training videos, and an annual conference. Coupled with 802 starting up its study on white-space issues, it looks like things are falling into place for a global standard in the next few years. (link) Now the potentially really bad news. The Obama team is looking to delay the DTV transition. Here’s the AP story, but I prefer the ranty goodness in this link. In a letter to key lawmakers Thursday, Obama transition team co-chair John Podesta said the digital transition needs to be delayed largely because the Commerce Department has run out of money for coupons to subsidize digital TV converter boxes for consumers. “With coupons unavailable, support and education insufficient, and the most vulnerable Americans exposed, I urge you to consider a change to the legislatively-mandated cutoff date,” Mr. Podesta wrote. For technical clarity (for those that don’t know): Analog TV broadcasts (54 MHz – 806 MHz) are (were?) to shut down next month. All broadcasts then switched to DTV in the bands from 54-698 MHz (channels 2-43) and that’s when white-space services (around the DTV transmissions except for channels 3,4, and 37) are (were?) supposed to start. But if the transition gets delayed, then 1) there’s less spectrum available (as there will be both analog and digital TV signals in band), 2) individual white space device approval / fielding might also have to wait (testing was for detection of DTV and impact to DTV, not analog TV). This would also screw up the 700 MHz auctions (Verizon and AT&T) as the bands wouldn’t have cleared and a MediaFLO deployment (Qualcomm) and some reallocated public safety spectrum. I’m concerned about the confusion that could be created,” FCC chairman Kevin Martin said during an on-stage chat at a premier Consumer Electronics Show in Las Vegas. To answer Martin, the economics term for the kind of message being sent is “regime uncertainty.” Hopefully that’ll get cleared up shortly after the 20th (preferably in a way that keeps the Feb 17th DTV transition date). (link) Writing for Ars Technica, Julian Simon thinks the DTV delay is being pushed at ClearWire’s behest – basically to muck up Verizon’s LTE deployments to the benefit of ClearWire’s WiMAX networks. AT&T now supports the delay, but wants compensation. It also appears that they weren’t planning on rolling out as fast as Verizon claims they were going to. While trying to find time to fix WordPress, several solicitations for cognitive radio papers have popped up which makes for a longer listing than normal below the fold. 3 times in the last 9 months (the most recent being the last couple weeks), wordpress has died on me (or at least not let me log in) until I hacked its code around some. Beyond my need to vent, this is a heads up that the blog may migrate in the future if / when I can figure out how to do that without screwing up people’s current RSS feeds. I was just emailed a press release announcing the formation of an industry group to define a protocol (PHY / MAC) for white space data networks. They hope to have a draft standard for comment available in the first half of 2009. Since I don’t have an external link, I’ve put the press release below the fold.